My favorite photo from my recent trip to Israel and the occupied Palestinian territories shows two women, one Bedouin Israeli and the other Jewish Israeli. 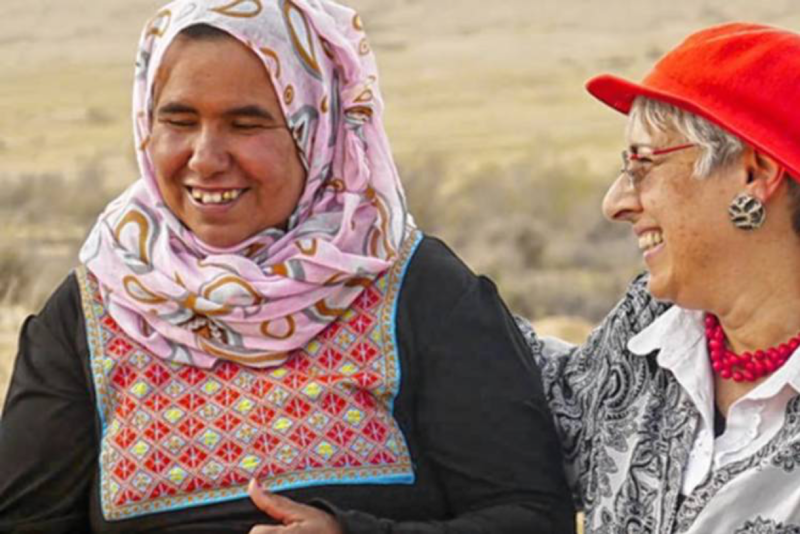 The photo was taken in the Negev Desert, where a group of Americans were listening to these women describe a joint effort by Bedouin Arabs and Israeli Jews to create an organic farm in the parched desert soil. The project, called Earth’s Promise, is funded by Healing Across the Divides (HATD), an organization founded by Dr. Norbert Goldfield, of Northampton. HATD funds public health programs serving vulnerable communities in Israel and the West Bank. The town of Yeruham, where the Israeli Jewish woman lives, was created as a refuge for Jews expelled from Arab countries in the 1950s and ’60s. The Bedouin woman lives nearby in Rachme, an unrecognized Bedouin village. Unrecognized villages receive no help from the Israeli government, which has been displacing Bedouins in the Negev in an attempt to relocate them to urban areas and replace Bedouin villages with forests. The policies of the Netanyahu government have created deep divisions in Israel between Jewish Israelis and those who fit into the category of “other,” including Bedouins, Israeli Palestinians, African asylum seekers and even Jewish Ethiopians. I was raised with a deep connection to Israel, yet today I feel shame over the xenophobia and racism displayed by Benjamin Netanyahu and his supporters, which runs counter to the Jewish values with which I was raised. These words from Leviticus are echoed in 35 different places within the Torah, “When strangers sojourn with you in your land, you shall not do them wrong. The strangers who sojourn with you shall be to you as the natives among you, and you shall love them as yourself; for you were strangers in the land of Egypt” (19:33-34). In the middle of Passover, the holiday that reminds Jews not to oppress the stranger, Netanyahu reneged on his promise, made only hours earlier, to stop the deportation of thousands of African asylum seekers, announcing that the plan to expel them to Rwanda and Uganda, where they faced imminent danger, was back on the table. His buddy, Donald Trump, went on a Twitter tirade on Easter, reasserting his promise to destroy the Deferred Action for Childhood Arrivals policy. When power trumps everything, these two so-called leaders chose politics over compassion, in order to placate their political bases. Despair comes easily as I witness the callous policies of both administrations, which demonize and punish those they categorize as “other.” Yet, when I look at the photo of the two women in the desert, I feel hopeful. Two women, who are supposed to be enemies, are sharing a vision that the seeds planted in thirsty desert soil will bloom with food and hope for a better future. I view these women as generals leading an army of resistance against hate. I returned from Israel in late March, and resumed my activities as co-coordinator of a circle of care that is assisting a Congolese refugee family that recently came to Northampton to begin the process of carving out a new life for themselves. Our circle has worked tirelessly attending to their many needs, but more importantly to provide them with a sense of community to help the family cope with the challenges of resettlement. The six circles of care based in Northampton also constitute an army of resistance against a president whose vicious words and immoral actions attack the core values that makes us human. This resistance compels us to give sanctuary to those threatened with deportation, to fill shipping containers with food and medicine for victims of the war in Syria, and to shower Puerto Rican hurricane refugees with the essential goods and services necessary to help them find their way. I used to believe that the only real weapon against the forces of evil was political action. Advocacy is critical to the fight against injustice. However, the ripple effect of humanitarian efforts should not be underestimated. Healing Across the Divides funds a program in Susiya, a Palestinian village in the West Bank that the Israeli government plans to destroy. 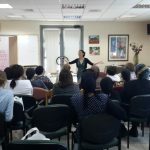 HATD funds therapeutic services to help traumatized families in Susiya, who have been attacked and vandalized by Israeli Jews from a nearby settlement of the same name. Not only has this program empowered parents to help their children manage their fears, it also sends a strong message that there are Jews who care. Grassroots efforts that bring Jews and Palestinians together, I believe, are the only hope for bringing peace to this region. Sara Weinberger, of Easthampton, is a professor emerita of social work and writes a monthly column. She can be reached at opinion@gazettenet.com.